Has anyone played with these balls? I remember them from childhood (mid-'90s) - someone would bring them to school to play. The impression that I had was that the ball was very hard and heavy - if it hit your finger, you'd feel pain, and it was pretty hard to hit it. Also, I think they actually weren't celluloid. I don't remember these balls as was out of the game for all of the 90's.However I have seen them for sale recently as rare antique table tennis balls from behind the Iron Curtain.Tempted to buy some? But, buying these balls today given that they were manufactured good 30 years ago... Does anyone have experience with balls as old? Does the material degrade over time, e.g. becomes fragile or lose its properties anyhow? Celluloid does degrade over time, sometimes it disintegrates, sometimes it even catches fire (i.e. old movie film). I'll have to tell what happened to that big bag of celluloid balls I had someday... I'll just say this - if you have a lot of celluloid balls, DON'T KEEP THEM IN A SEALED PLASTIC BAG! These were probably like the old barna balls, which were actually made of plastic, felt heavy and were virtually indestructable. Do you know if those plastic balls were allowed for tournaments back then? Also, I guess that plastic was different from what the balls are made of today, correct? Yes they were allowed, they were legal as far as I remember. Note that there were 30mm balls, not 40mm balls. Yes they were made of different material compared to today. 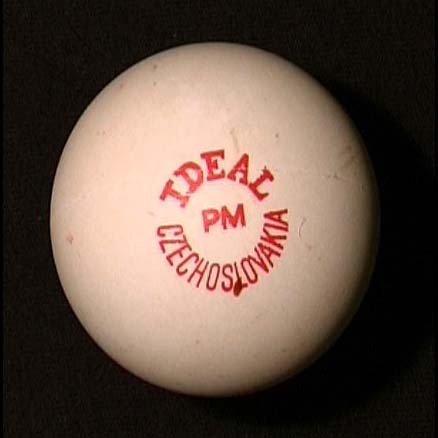 Plastic ball (PM = Plastová Míček) of early origin. 38 mm diameter, hefty ball of 3 grammes. Feels much like ebony globula. Beach sandy players would like it very much. One wonders what the old Soviet balls were like. Or if there ever were any Soviet blades and rubbers. Maybe they just got everything from China, even back then. Oh, we played with Soviet balls at school - they were called "Sport" and they were crap Extremely undurable. I believe the pros were mostly using Stiga as they had a factory in Estonia. I'm not aware of any Soviet blades or rubbers. What did the schoolkids use? When I was in school you could either get a Butterfly Biriba bat (came in a vaccuum formed plastic + cardboard package), or you could get one of a number of really cheap, Chinese-made bats from a Chinese bookstore. The topsheets would come loose in about a month. Yes, almost everyone played Japanese Penhold back then. Balls? You COULD get 3 star Nittakus or TSPs (rare) but they were expensive if you were buying this out of lunch allowance money. No lesser star Nittakus (didn't know they even existed). So for the most part we used Shield or Champion balls from China. These had a SEAM (a real SEAM - if you scaled it up to Death Star size you could fly a X-wing down the seam), which actually weren't bad. They would break, but no more so than the Nittakus. I (like I believe all my friends) was playing with a premade racket - a 3 star Stiga with a FL handle in my case.